Sakira is a Colombian singer, songwriter, dancer, record producer, model, and choreographer. Her father, William Alberto Mebarak Chadid, was born in New York City, New York, U.S., and is of Lebanese descent. Her mother, Nidia del Carmen Ripoll Torrado, is Colombian, born in Arenosa, Colombia. Shakira’s mother’s ancestry includes Spanish [Castilian], Catalan, and Italian/Sicilian, and possibly other. Shakira has two children, Milan Piqué and Sasha Piqué, with her partner, Catalan Spanish football player Gerard Piqué. Sakira’s name, Shakira, means “thankful” in Arabic. She uses Turkish-Arabic belly dancing in a lot of her performances. Shakira’s paternal grandfather was Alberto Mebarak Spath (the son of Moisés Isaac Mebarak and Labibe Spath S.). Alberto was born in Cartagena, Bolívar Dept, Colombia, to Lebanese emigrants, from Beirut and Zahlé, respectively. Moisés was the son of Isaac Mebarak and Marta. Labibe was the daughter of Moisés D. Spath and Marie (or María in Spanish) S.
Shakira’s paternal grandmother was Isabel Chadid Baizer (the daughter of Pedro Chadid Raide and Rosa Baizer Gandur). Isabel was born in Sincelejo, Sucre Dept, Colombia, to Lebanese parents. Pedro was the son of Tannus Shdid, later Antonio Chadid Harb, and of Sade Raide. Pedro moved to Colombia in 1895. Rosa was the daughter of Abraham Baizer and Juana Gandur. 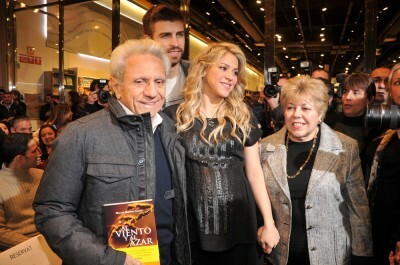 Shakira’s maternal grandfather was Tomás Eduardo Ripoll Jiménez (the son of Cristóbal Ripoll Carrasquilla and Elena Leocadia Jiménez). Tomás Eduardo was born in Piojó, Atlántico. Cristóbal was the son of José Antonio Ripoll Ramos and Rosaura “Rosa” Carrasquilla. Elena was the daughter of an unknown father and Magdalena Jiménez. Shakira’s maternal grandmother was Josefina Torrado Núñez (the daughter of Adriano Natividad Torrado Verjel and Mercedes Núñez Pisciotti). Josefina was born in Ábrego, Norte de Santander. Natividad was the son of Francisco José Torrado Carvajalino and María Victoria Verjel Torrado. Mercedes’ parents had the surnames Núñez and Pisciotti. Shakira has said that she has Italian/Sicilian ancestry from her Pisciotti line. She stated this here (from 0:41) and here (from 3:20). Shakira’s third cousin once removed is Internet personality Manolo González. Shakira’s maternal grandmother was Josefina Torrado Núñez (the daughter of Adriano Natividad Torrado Verjel and Mercedes Núñez Pisciotti). Josefina was born in Ábrego, Norte de Santander. Natividad was the son of Francisco José Torrado Carvajalino and María Victoria Verjel Torrado. Mercedes’ parents had the surnames Núñez and Pisciotti. Rosa was the daughter of Abraham Baizer and Juana Gandur. Moisés was the son of Isaac Mebarak and Marta. Correct Alberto’s mother to Labibe Spath S., and she was the daughter of Moisés D. Spath and Marie (or María in Spanish) S.